I want you to take a second and imagine what your life would be like if you didn’t have to work. If all your financial worries didn’t exist. You’re not rich to the point where you could buy all your relatives houses, but you have enough to never have to worry about not being able to feed yourself or pay those pesky bills. Many people just assume that they can never achieve this state of financial independence. That’s sad. Because, with some patience and hard work, financial independence is achievable by everyone. Before I show you how you never have to worry about money problems ever again, let’s talk about what financial independence is. Ask three different people what financial independence means to them and you’re likely to receive three different answers. In the financial industry, however, the common definition of financial independence is owning enough cash-flow positive assets or having enough wealth to live off of without having to work. The income generated from the interest on your money must be at least equal to your expenses to be considered financially independent. Since financial independence depends on your expenses, the amount of wealth you need to save varies from person to person. A good rule of thumb is to have a net worth that is 25x your annual expenses. If you use the 4% rule (the maximum safe withdrawal rate) to withdraw your money, having 25x your annual expenses means that you’re very unlikely to run out of money before you die. Not running out of money before dying, to put it bluntly, is the goal of retirement. Financial independence is often shortened to FI and very often associated with early retirement. When someone has achieved financial independence and retired early it’s referred to as FIRE (Financial Independence Retire Early). There is a large online community based around striving for FIRE. What would I do with my life if I didn’t have to work for money? Unless you absolutely love your job, answering this question truthfully will make you rethink the many hours you spend working. I won’t blame you if you’re next question is: how do I become financially independent? Continue reading for the answer. Your savings rate is the number one factor that affects your retirement date. Increasing your saving rate by 5% allows you to retire 6 years earlier! Your savings rate is calculated by taking your current annual savings, dividing it by your annual gross income and multiplying it by 100. 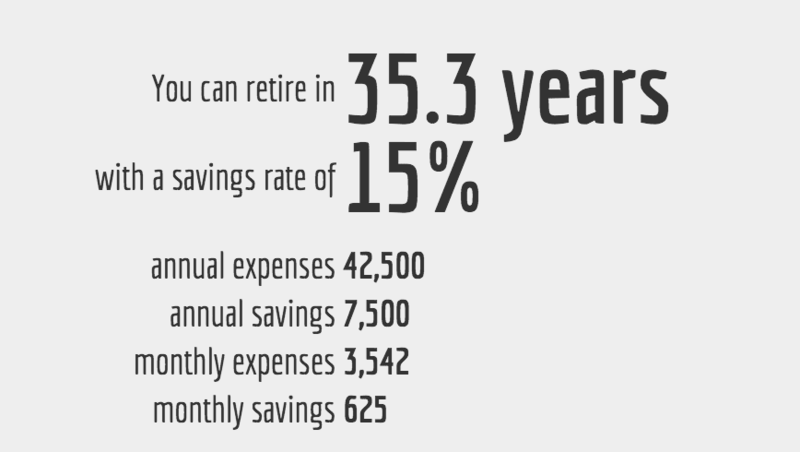 You can play around with this early retirement calculator to see how long it will take you to save up enough wealth to retire. But keep in mind that the calculator makes the assumption that you will have the same monthly expenses in retirement as you do while you’re working which isn’t true for most people. There are only two factors that can increase your savings rate: your annual expenses and your annual gross income. You can play with these variables to change your financial independence date. Many members of the FIRE community are extremely frugal and are proud of their savings rate. They will tell you that decreasing your expenses is the best way to shorten the path to FI. Don’t get me wrong, reducing your monthly expenses will always be beneficial towards your financial health. But to me, it’s much easier and better for everyone’s happiness to strive for a higher income. There’s a limit to how many expenses you can cut out of your life before you drive yourself and everyone around you crazy. But there is no limit on how much money you can make. Let’s say that I make $50,000 a year at my job. With a savings rate of 15% (the U.S. personal savings rate for Jan 2018 was a measly 3.2%) it would take me around 35.3 years to reach financial independence. I would be saving $7,500 annually and have $42,500 in disposable income (minus taxes). 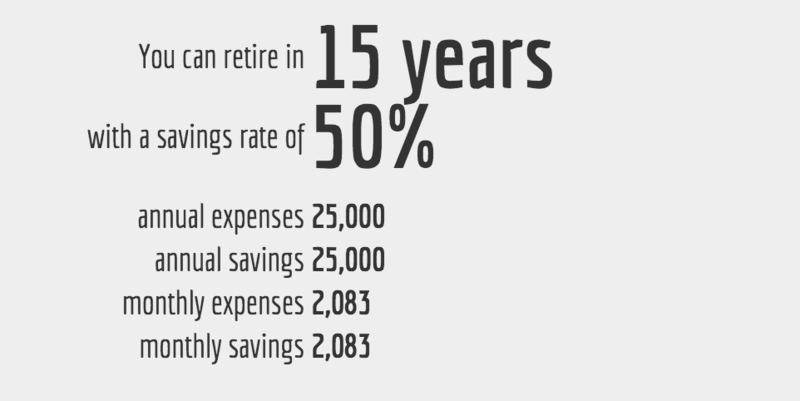 If I bump that savings rate up to 50% by reducing my expenses, I would now be retiring in 15 years instead of 35. However, since my annual savings jumped up to $25,000, my disposable income dropped to $25,000. While you can live off that amount, you’ll be hard-pressed to enjoy any luxuries. Especially if you plan on supporting a family. If, however, you increase your income by $17,500 and put that all towards your savings, your savings rate would be around 37%. You would still be saving $25,000 a year and also still have $42,500 in disposable income. It would no take you 20 years to retire. 5 more years than if you reduced your income, BUT you would have nearly double your disposable income before and during retirement. And, of course, if you could survive off $25,000 a year, then you would be able to retire in 10 years. I’m always going to advocate the route of increasing your income over cutting your expenses. Achieving financial independence is simple but not easy. Do some lifestyle design and cut unnecessary expenses. You can have anything you want, but not everything. No matter what your income level is at, spending less is powerful. We’ve all heard of athletes making millions of dollars a year going bankrupt. Don’t be like that. Work to increase your income. There are hundreds of ways to increase your income. Whether it’s asking for a raise, moving jobs, or even changing your career path. You can also have multiple income streams [LINK] by working on side hustles, side-gigs, and projects. Increasing your savings rate to accelerate FI. By increasing your income and cutting expenses, you give yourself the potential to skyrocket your savings rate. But you actually have to save that extra money. It’s all too easy to fall into the trap of spending that money on vacations or a bigger TV. Investing wisely to make your money work for you. All that extra money you have now needs to be invested. Compound interest is the name of the game here. It’s what makes retirement possible. How long will it take you to reach financial independence? Is financial independence realistic for the average person? Absolutely. While it’s true that the lower your income, the harder it will be, everybody has the potential to be financially independent. If you have a low income, that can be changed; if you have a low savings rate, that can be fixed; if you’re up to your eyeballs in debt, that can be remedied. It will take discipline and hard work, but it’s possible. To figure out how long it will take you to retire with the same amount of annual expenses you have now, take a look at this chart. 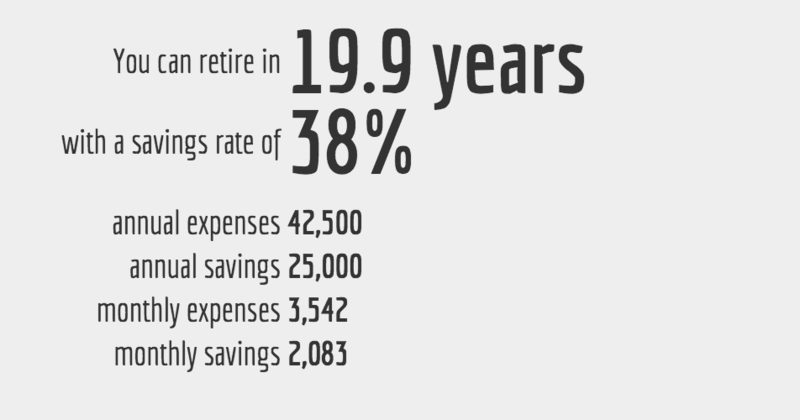 Your savings rate has a direct impact on how many years you have to work your job. So hopefully this article has got you all fired up to reach financial independence. If you’re not sure what to do next, check out the following resources.